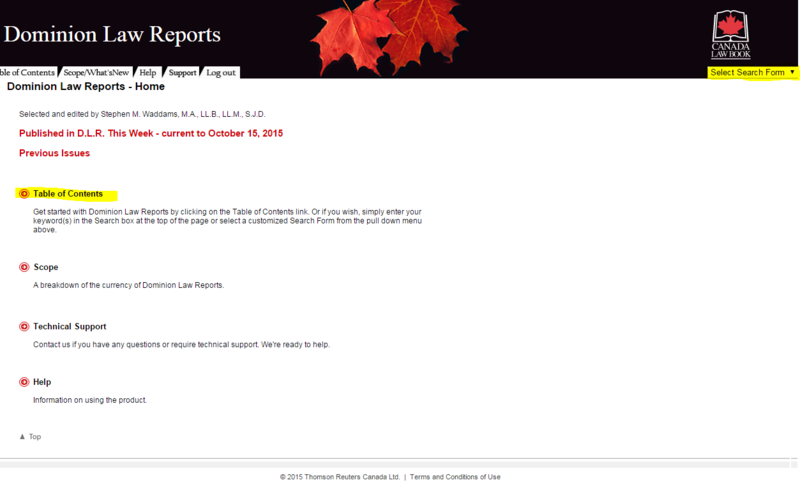 We now have access to the Dominion Law Reports Online. You can access the series via the link on the library catalogue. The services is provided by Carswell and Canada Law Book online and you login with your usual IT services username and password. 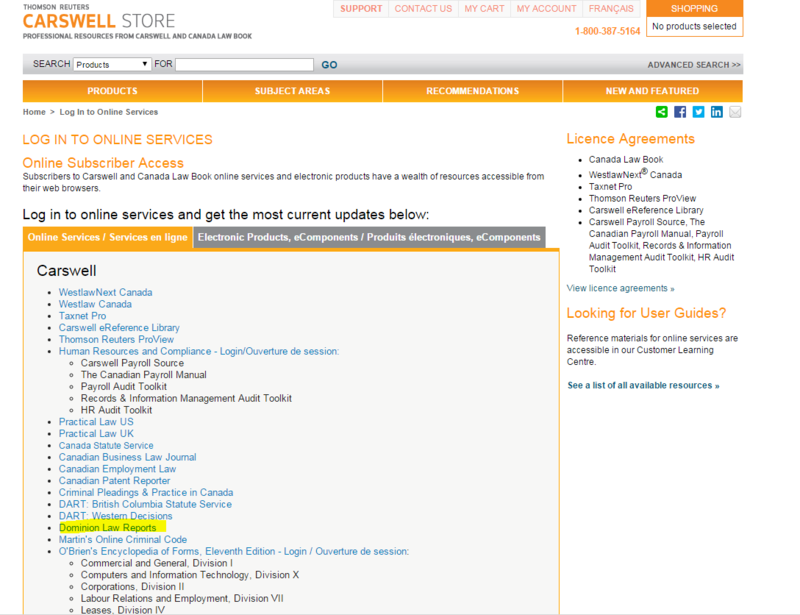 Choose Dominion Law Reports from the listing – shown highlighted below. Then you can either browse for the material you want or run a search. Note the highlighted areas below for browsing and search options. You may use the table of contents to browse for a case or a section that you wish to review. Click on the Table of Contents tab which appears on the left side of the screen. You can then expand the menu by clicking on the small “+” symbol, or collapse the menu by clicking on the “-” symbol. This form will search for term(s) in the index documents. Index documents consist of a collection of catchlines from similarly classified cases, including a link to the full-text judgment. To search, you can enter a word or phrase, and/or a court, and/or a date range and click ‘search’. The ‘or search’ check box option allows you to expand your search to include search results for at least one of your terms. The ‘phrase search’ check box option will treat your search terms as a phrase. To show words around hits, select the number of words to include in the pull-down box. The Case Law Search will search for term(s) within the cases. To search the Case Law, you can enter a word or phrase, and/or a court, and/or a judge, and/or a date range and click ‘search’. The ‘or search’ check box allows you to broaden your search to find cases in which at least one of your search terms appears. The ‘phrase search’ check box will treat your search terms as a phrase. The Case Name Search allows you to locate a case by party name. If you know the name of the case, simply enter the name in the box provided and click ‘search’. A ‘date range’ option is also provided to further narrow the search to a specific date range, as there can be cases with the same name. The citation search allows you to go to a particular case or page of a case. Simply enter the Volume number, Page number, choose the relevant series from the pull-down menu and then click ‘search’. This option allows you to narrow your search to a particular folder, case or section. When you select the Advanced Search form, the Table of Contents will display check boxes next to the headings. The check boxes allow you to limit your search to the folders or sections that you wish to search. Simply enter the words you wish to search for, check the appropriate box(es) in the Table of Contents and click ‘search’. The Advanced Search includes a Query Syntax Summary to help you enter your query correctly. We have access to print versions of the DLR up to Volume 375 of the Fourth Series in the Lasok Law Library – all subsequent volumes will be available online only. A number of free resources are also available if you are interested in additional Canadian Case Law. The CanlII and the Lexum online services are recommended. The CanLII website provides access to court judgments, tribunal decisions, statutes and regulations from all Canadian jurisdictions. The Lexum collection contains the Supreme Court of Canada judgments since its creation in 1875 and judgments in leave applications since 2006. The collection is updated within minutes of the public release of the judgments by the Court. This entry was posted in E-Resources, Law on 20th Oct, 2015 by Lee Snook.